In this article, we’re going to develop a Peer-to-Peer (P2P) Chat application. 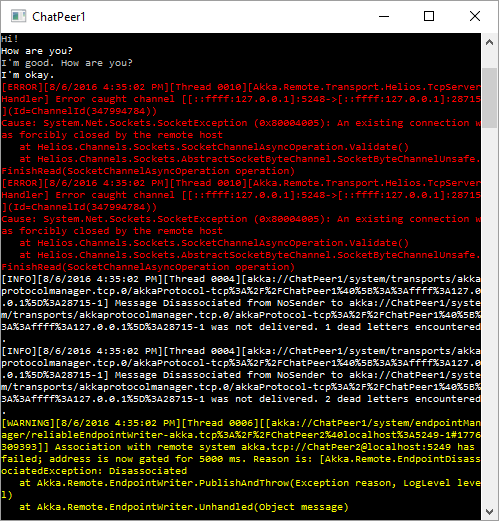 This means that unlike the official Chat example, which has distinct Client and Server roles, each running instance of the application is exactly the same, except for configuration. The Akka.Remoting documentation explains that Akka.Remote is better suited for P2P applications rather than client/server. In my typical style, I am keeping this example super simple so that we can focus on learning to message remote actors using Akka.Remote. I am still learning to use Akka .NET, so do not consider this article as an example of best practices. 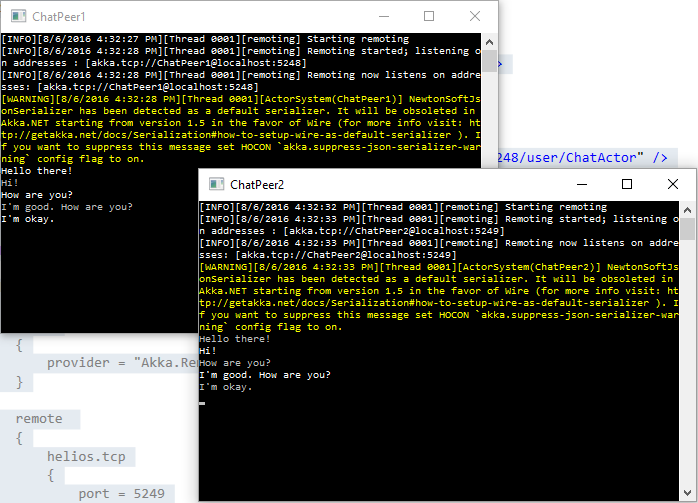 Aside from the Akka package needed by all Akka .NET applications, we will also need the Akka.Remote package if we want to send messages to remote actors. The provider part is always the same, so you can just copy it. The helios.tcp section specifies the TCP endpoint on which the ActorSystem will listen for incoming connections, in this case localhost:5248. The actorSystemName setting has two purposes here. We will use it to display a different console title, so that we can distinguish between different running instances of the same application. We will actually give a different name to each running ActorSystem. Typically you could just have one instance connect to the other, and the second communicates to the first via Sender.Tell() as in the Sending Messages to Remote Actors documentation. I arbitrarily chose not to do this to keep the application instances as symmetrical as possible (which is a typical trait of P2P applications). From all this code, there are only two parts that are important to note. First, we are creating a local chat actor. 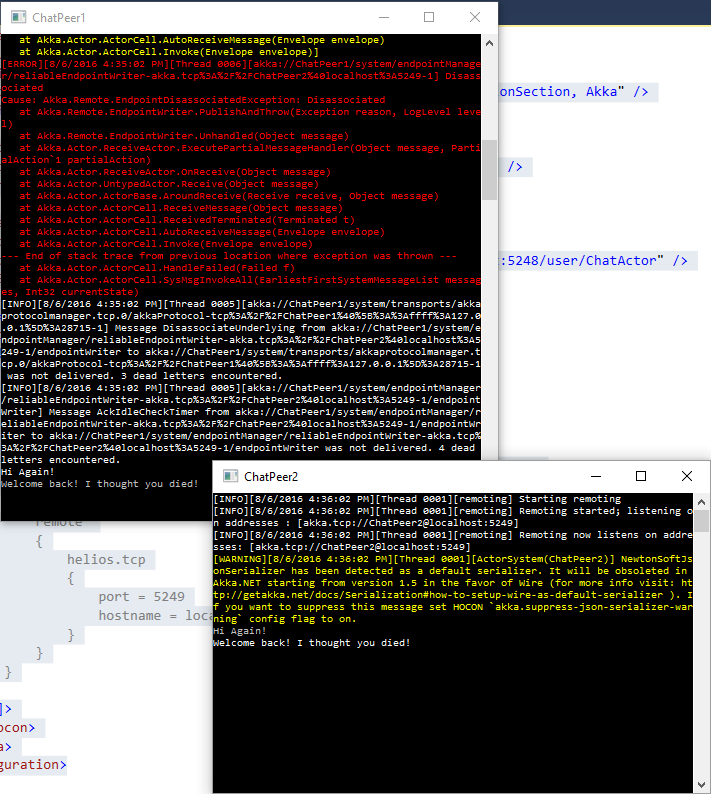 This is what the remote actor will connect to in order to talk to the current instance of the application. It does this using the highlighted portion of code. It is simply getting a reference to the remote actor (using the address we specified in configuration) and locating it via an ActorSelection. We want to run two instances of the same application, but using different configuration. This not only allows us to recognise which is which, but also ensures that each instance can connect to the other at the right endpoint. The applications could run on the same machine or on different machines altogether. Thank you very much – very helpful example!